International Training course “Move it!” to be held in the Republic of Moldovaaims at developing competences of youth leaders and youth workers for inclusion of young people with fewer opportunities into the youth projects within the EU “Youth in Action” programme, promoting tolerance towards cultural diversity as common value on the local, national and international levels and prevention of exclusion. It focuses on fostering European awareness on benefits of intercultural relations and social inclusion; it highlights the importance of active participation of youth, regardless of person’s social background and financial situation. 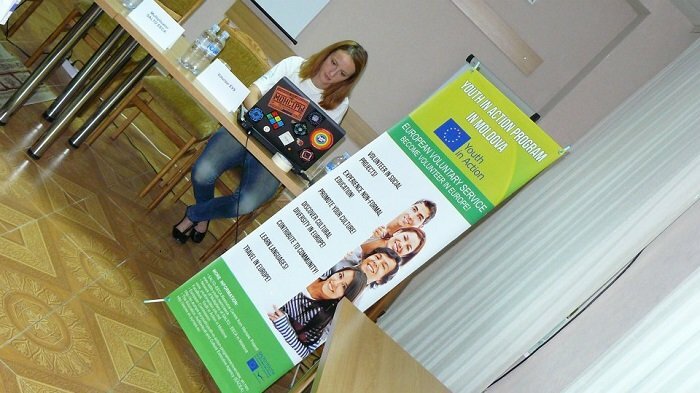 Using the approaches of non-formal learning, intercultural and outdoor experiential learning we would like to understand, what exclusion is and how to overcome it, developing concrete inclusion projects within the EU “Youth in Action” programme – such as youth exchanges, youth initiatives and youth democracy projects at local and international levels. The project will also stimulate a dialogue between eastern and western youth, achieved by discussing the topic of dance and music from ancient Christian, Muslim Spain, medieval Italy as well as from Eastern Europe and Caucasus countries. Methodology of the training course follows the main principals of non-formal education and training in Europe. Main approaches that will be followed during the training course are experiential learning, intercultural learning, active participation and group dynamics. And, of course, as one of the important focuses for us is dance and music experiential learning, then the dance and music activities are going to be included and experienced. Costs: Board, lodging and 70% of travel costs will be covered by programme. The 30% of travel costs and insurance to be covered by participants*. Please inform ADVIT Moldova the soonest about your travel details! All other expenses during the activity, such as board, lodging and transportation, will be borne by the organisers. Insurance is covered by the participants themselves. Board & Lodging will be paid only from the September 28th – October 6rd 2013. Contact : info@edu-active.com ( ONLY for Azerbaijani ) please ! Thank you and will look forward to see you in Moldova!